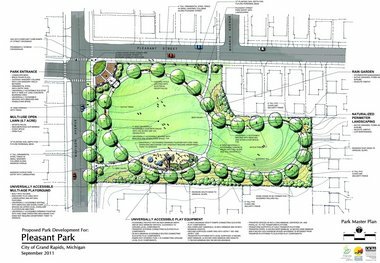 “We’re working on that as we speak,” said Parks and Recreation Director Jay Steffen Thursday after the city announced it has been approved for a $300,000 grant by the Michigan Natural Resources Trust Fund Board. Steffen said the state and federal grant will expire if the local share, about $319,000, is not raised from private fund-raising, philanthropic grants or sponsorships. Part of the money raised will be used to set up a permanent maintenance endowment for the park. The $300,000 state grant, plus $112,240 in federal grant money, will be used to transform a 2.3-acre site that was last used as a parking lot by Kent County’s Department of Human Services. The city acquired the land in 2009 as part of a land swap with the county. The new park will include a playground, walking paths and open space for an urban neighborhood that has little green space, city officials said. The park was designed last year in a “charette” in which neighborhood residents participated. The Natural Resources Trust Fund board recommended more than $16 million for 77 projects throughout the state this week. The program derives its funding from royalties on the sale and lease of state-owned mineral rights.